Warren County Sheriff Bud York has earned Accreditation of his Public Safety Answering Point from the New York State Sheriffs’ Association. Only 14 of the State’s 62 counties have qualified for PSAP accreditation to date. Sheriff York and his Office also have earned Civil, Corrections and Law Enforcement accreditation. NYSSA Executive Director Peter Kehoe presented the Certificate of Accreditation to Undersheriff Shawn Lamouree at a meeting of the Warren County Board of Supervisors. He recognized several individuals who were instrumental in achieving accreditation: Communications Supervisor Lawrence Jeffords, Senior Communications Officer Brian Engle, Senior Communications Officer Lisa Mansfield, and Senior Communications Officer Derrick Helms. Congratulations to all. 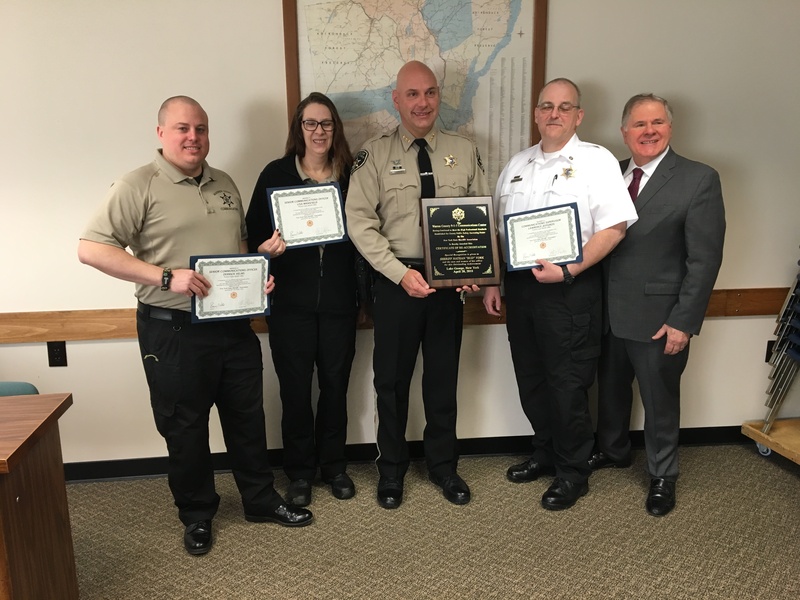 Photo (l to r): Senior Communications Officer Derrick Helms, Senior Communications Officer Lisa Mansfield, Warren County Undersheriff Shawn Lamouree, Communications Supervisor Lawrence Jeffords and NYSSA Executive Director Peter Kehoe.